This weekend at Columbus Crew Stadium, the inaugural USA Sevens Collegiate Championship Invitational… rugby. Starts Friday runs through Sunday. Who was invited? Arizona, Arizona State, Army, Bowling Green, California, Dartmouth, Florida, Harvard, Indiana, Navy, Notre Dame, Ohio State, Penn State, San Diego State, Tennessee and Utah. Today’s Groupon is 50% off tickets. Children 14 and under free with an adult. This is #81 of ’365 Things to Do in Columbus Ohio.’ ’365 Things to Do in Columbus Ohio’ is on this site but also it is a page on Facebook. Add something in Central Ohio to do (place, event, restaurant…) on ’365 Things To Do in Columbus Ohio’ on Facebook and if it is good, I will write about it here too. If it is SPAM… I will delete it. 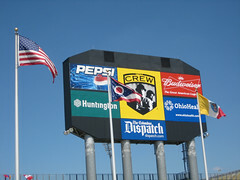 Image Credit Crew Stadium The photograph is the property of tlarrow and licensed with a Creative Commons license that allows commercial use.